PLEASE READ THE FOLLOWING TERMS OF SERVICES & LEGAL NOTICES (“THIS AGREEMENT”) CAREFULLY BEFORE USING THE Ftworthbankruptcy.com WEBSITE (the “Site” or “EbertLawOffices”). These terms explain your (and our) rights under this Agreement, and make certain disclosures required by the law. By using the Site, you give your assent to the terms of this Agreement. If you do not agree to these terms, you may not use the Site. 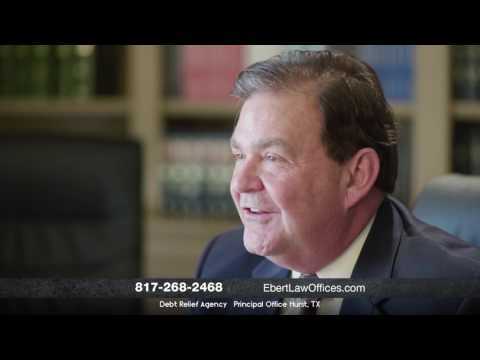 FtWorthBankruptcy.com (“Ebert Law Offices, P.C.”,” “We” or “Our”) has the right, in our sole discretion, to modify, add, or remove any terms or conditions of this Agreement without giving individual notice to you, by posting the changes on the Site. Your continuing use of the Site signifies your acceptance of any such changes. However, since chapter 11 does not usually pertain to individuals whose debts are primarily consumer debts, further information about chapter 11 will be provided by reference to the following resource: The ABankruptcy Basics@ brochure prepared by the Administrative Office of the United States Courts, dated June 2000, and which can be accessed over the internet by visiting the following website: www.uscourts.gov/bankruptcycourts.html. This Site is maintained by Ebert Law Offices, PC (The “Law Firm”) to facilitate the public’s ability to learn about bankruptcy law and to interact with bankruptcy attorneys. In addition to educating the general public about bankruptcy law, Ftworthbankruptcy.com provides users with the ability to submit information about their specific bankruptcy case, and to request to be contacted by one of their staff to discuss their case and to possibly hire it to represent them. THIS WEBSITE IS AN ADVERTISEMENT OF LEGAL SERVICES, and all of the materials and information on the Site are provided for informational purposes only, and may not reflect current legal developments or variances in the law of different jurisdictions. Nothing on the Site should be construed as legal advice or used as a substitute for legal advice. FtWorthBankruptcy.com does not provide legal advice. The materials and information on the Site do not necessarily reflect the opinions of the attorneys of the Law Firm, their partners, clients or affiliates. The information in the Site is not guaranteed to be correct, complete or up to date. The Site is not intended to, and does not, constitute or create an attorney-client relationship between you and the attorneys of any of the Law Firm, their partners, employees, agents or affiliates, or any other attorney associated with the Site. Additionally, the mere receipt of an e-mail from or a “post” on the Site does not create an attorney-client relationship. By submitting information to us, you agree that we may release your contact information and all information that may be submitted by you to the Law Firm, and/or to other agencies which are not part of the Law Firm group, and you further agree and understand that they may contact you directly should they have any interest in discussing your case with you, unless you request in writing your desire not to be contacted. In no event, however, shall we be obligated to release any submitted information to our any other law firms, including contact names, but rather may or may not do so at our sole discretion. Additionally, by agreeing to these terms and conditions you are also agreeing to FtWorthBankruptcy.com’s terms and conditions found here. Furthermore, in no event is the Law Firm obligated to contact you with regard to your case, but rather may or may not do so at its sole discretion. By accepting the submission of your information, we do not offer any advice on whether you may have a valid defense to your bankruptcy case. If, after discussing your specific case with the Law Firm, the attorney is willing to represent you in the specific matter you have presented to them, they will send you a retainer agreement that you will need to sign and return before they can represent you in that specific matter. If either the attorneys or you do not agree in writing to create an attorney-client relationship, none will exist. In the meantime, you are encouraged to seek and retain the advice of other counsel so as to meet all applicable deadlines that govern your bankruptcy case. PLEASE NOTE: Submitting information to this site does not establish an attorney-client relationship or non-attorney advocate-client relationship. No attorney-client relationship or non-attorney advocate-client relationship is created by the information provided here or by any consultation with the Law Firm’s attorneys or staff or non-attorney advocate’s employees. By submitting information to this site you are giving permission to this site to review the information and possibly forward the information to a sponsoring attorney, non-attorney advocate, or other marketing partners and have that entity contact you via phone, email, text message or regular mail. By submitting information to us, you also agree to receive special offers and marketing communication from the Law Firm and/or one of our affiliates. You may opt out of these communications at any time by clicking the “unsubscribe” link in the marketing email or by notifying the Law Firml in writing that you no longer wish to receive these communications. By submitting information to us, you also agree to receive special offers and marketing communication from FtWorthBankruptcy.com and/or one of our affiliates. You may opt out of these communications at any time by clicking the “unsubscribe” link in the marketing email or by notifying FtWorthBankruptcy.com in writing that you no longer wish to receive these communications. We reserve the right at any time and from time to time to modify or discontinue, temporarily or permanently, the Site (or any part of it) with or without notice. In the event of a modification or discontinuance, all information submitted by you and others may be lost. You agree to keep a permanent record of all information provided to us, and you agree that all information submitted to us is at your sole risk. You agree that we have no responsibility or liability for the deletion or failure to store any Content maintained or transmitted by the Site including without limitation messages and other communications. You agree that we shall not be liable to you or to any third party for any modification, suspension or discontinuance of the Service. You are prohibited from using any type of computer “worm,” “virus” or any other device that is intended or is likely to disrupt, overload, or otherwise impair the workings of any part of the Site. If you do engage in such conduct, the resulting damage will be hard to quantify as a dollar amount and thus you hereby agree to pay us liquidated damages in the amount of $5,000 for each day that the Site is damaged until the Site is completely repaired. This amount is derived by estimating the value of (1) the loss of good will caused by an inoperable site, and (2) the time and money it will take to repair the Site and to address the concerns of visitors. We are required to use reasonable efforts to repair the Site as quickly as possible. This clause will not prohibit us from seeking additional compensation if your conduct injures us in a way not expressly contemplated herein. You shall not intentionally or unintentionally violate any applicable local, state, national or international law, including, but not limited to, regulations promulgated by the U.S.
Securities and Exchange Commission, any rules of any national or other securities exchange, including, without limitation, the New York Stock Exchange, the American Stock Exchange or the NASDAQ, and any regulations having the force of law. the site architecture; (9) use any automatic or manual process to harvest information from the Site; (10) use the Site for the purpose of gathering information for or transmitting (a) unsolicited commercial email; (b) email that makes use of our name or trademarks, including in connection with invalid or forged headers, invalid or nonexistent domain names, or other means of deceptive addressing; and (c) unsolicited telephone calls or facsimile transmissions; (11) use the Site in a manner that violates any state or federal law regulating commercial email, facsimile transmissions or telephone solicitations; and (12) export or re-export the Site or any portion thereof, or any software available on or through the Site, in violation of the export control laws and regulations of the United States. You agree to indemnify and hold us, and our licensors, subsidiaries, affiliates, equity holders, directors, officers, agents, third party contractors and employees, harmless from all damages, costs, liabilities, and any claim or demand made by any third party, including reasonable attorney’s fees due to or arising out of Content you submit, post to or transmit through the Site, your use of the Site, your connection to the Site, your violation of this agreement, or your violation of any rights of another person, or due to or arising from such activities carried out by a person using your FtWorthBankruptcy.com account or password, with your knowledge. Neither the Law Firm nor FtWorthBankruptcy.com operate as a lawyer-advertising cooperative, lawyer referral service, prepaid legal insurance provider, or similar organization the business or activities of which include the referral of customers, members, or beneficiaries to lawyers for the performance of fee-generating legal services or the payment for or provision of legal services to the customers, members, or beneficiaries in matters for which they do not bear ultimate responsibility. Any attorney practicing bankruptcy is now required to state: We are a debt relief agency and help people file bankruptcy under the bankruptcy code. Within the Site, we may include descriptions of successful lawsuits brought by the Law Firm, or other attorneys not affiliated with us or the Site. These descriptions are not meant to create any unjustified expectations that similar results can be obtained for others, for each case turns on its own specific factual and legal circumstances. No attorney can guarantee the success of a case and past successes even in very similar lawsuits do not mean that success in a subsequent case is guaranteed or even likely. Past success cannot be an assurance of future success because each case must be decided on its own merits. Results depend upon a variety of factors unique to each case. This Site is not intended for the purpose of advertising legal services to be performed in any state solely by the Law Firm, unless they are specifically licensed to practice in that respective State. To the extent that this Site does not comply with the laws or regulations of any jurisdiction in which it may be received, the Law Firm does not wish to, and will not knowingly, accept legal representation based on or resulting from the use of the Site from a person located in that jurisdiction. Neither the Law Firm or FtWorthBankrutpcy.com wish to, or knowingly will, accept legal representation based on or resulting from the use of the Site from a person located outside the United States. YOUR USE OF THE SITE IS AT YOUR SOLE RISK. ALL CONTENT AND SERVICES ON THE SITE IS PROVIDED SOLELY ON AN “AS-IS/AS-AVAILABLE” BASIS. TO THE EXTENT PERMITTED BY APPLICABLE LAW, WE EXPRESSLY DISCLAIM ALL WARRANTIES OF ANY KIND, WHETHER EXPRESS OR IMPLIED, INCLUDING, BUT NOT LIMITED TO THE IMPLIED WARRANTIES AND CONDITIONS OF MERCHANTABILITY, SATISFACTORY QUALITY, FITNESS FOR A PARTICULAR PURPOSE OR USE AND NON-INFRINGEMENT. Any disputes arising out or related to use of this Site, this agreement and/or the relationship between you and us shall be submitted to arbitration in Fort Worth, Texas carried out in accordance with the rules of the American Arbitration Association. FtWorthBankruptcy.com and its affiliates provides a forum for various mortgage lenders, car dealerships and other service providers to list their contact information within the portion of this Site or affiliated Site. This service is subject to all limitations and disclaimers set forth elsewhere in this Agreement. Specifically, and not by way of limitation, FtWorthBankruptcy.com makes no representations or warranties regarding these service providers, including, without limitation, that they traditionally work with individuals who have been through a bankruptcy, that they will work with you or that their products and/or services are competitively priced or otherwise offered on attractive terms. This portion of this Site is intended as nothing more than a directory for services providers which have paid a fee to FtWorthBankruptcy.com for inclusion of their listing. Any and all claims arising out of your use of any service listed in this portion of this Site shall be limited to the particular service provider with which you have an issue, and FtWorthBankruptcy.com shall not be liable for any costs, damages or expenses incurred by you on account of your electing to work with any of the service providers listed on this Site. You agree to indemnify FtWorthBankruptcy.com and its affiliates for any costs, damages or expenses incurred by it on account of your use of this service.